Lightly dry-hopped for a gentle floral aroma, this American Blonde Ale is light in colour and medium bodied to suit. A simple mix of classic pale malts paired with a mild bitterness impart this beer with drinkability and easy going flavour components. Pouring a light copper with a thick white head, this full-bodied Pilsner has a floral aroma accented with notes of lavender and honey. The caramel malts that aide in its robust colour impart a slightly sweet taste that finishes clean with a crisp spicy bitterness. Hibiscus and rose hips combine with Belgian yeast to create a crisp and refreshing wheat ale packed with floral notes, banana, raspberry and a touch of spice. Bread crust, chocolate, nuts and toffee emanate from this Munich Dunkel. With a surprisingly light mouth feel, this unfiltered lager has a dominant malt flavour accented by notes of almonds, toast and a touch of caramel. All which contribute to the well-rounded complexity and depth that this classic German style has to offer. Pouring gold with a fluffy white head this assertive German Pilsner is made with Weyermann Barke Pilsner malt and a selection of Noble hops. Crisp, clean, with notes of honey, graham cracker, biscuit, and a refreshing and lengthy bitterness, Simple Things is made the way a beer should be… with water, malt, hops, yeast, and time. Locally roasted coffee, sourced from small holder farmers in Ethiopia’s Guji Sidama region, provides a rich yet delicate floral aroma with notes of brown sugar, grapefruit and caramel. A German malt base imparts a crispfinish and a subtle biscuit flavour pairing well with the cocoa and roasted flavours that the coffee provides. Pouring a beautiful copper with a rich German malt aroma and subtle sweetness, the Steel & Oak Märzen soars upon a delicate balance of Pilsner, Vienna and Melanoidin malts that will remind you of the warmer months ahead. Brewed with Amchoor this refreshing 4.6% crusher has big notes of citrus, orange peel, and unripe green mango. It finishes dry with a refreshing tartness from the Amchoor spice. Just in time for the sun, we got together with our friends at BREWHALL for a “home and away” Kveik collaboration series. Brewing one beer at their place and one here at ours. Using this ancient yeast strain, we brewed a bright, refreshing Wheat Ale with lemongrass, lime and szechuan peppercorn that we think is just perfect for patio season and beyond. A Kviek Gose, brewed at BREWHALL with Vancouver Island Salt Co. sea salt and coriander. There is a refreshing lemon sourness, bright spice and a mineral salinity that showcases the Canadian pacific where the salt was harvested from. This thirst quenching beer brings to mind the ocean breeze on a hot day. Juniper berries and Northwest hops give Kataja gin-like notes with a twist of citrus. A complex malt bill of rye, oat and barleymalts is followed by a crisp bitterness, not from hops, but from the juniper berries themselves. A love song from S&O and Gigantic Brewing, this stout was brewed with whole BC oysters from Desolation Sound, sourced by @bigshucker. Added to the boil of this full bodied stout, the oysters impart minerality and a pleasing briny note. A hearty addition of cacao nibs post fermentation accentuate the chocolate and roasty notes from the malt to round out this collaborative brew. Banana, spice, and clove leap through the fluffy white head of this traditional German-style wheat beer. Malt sweetness and the warming notes of alcohol will make you feel like you could brave a snowstorm in shorts and flip-flops. But don’t. Honey and Beechwood Smoked Malt add further depth to this already complex strong German style lager. The Steel & Oak Smoked Honey Doppelbock is best enjoyed while seated in a leather chair with your feet up on a rich mahogany coffee table. Inspired by the smoked beers of Bamberg, Germany, this homage to tradition was brewed using a generous amount of beechwood smoked malt. Our Rauchbier pours a deep amber and has a robust, smoky flavour balanced by subtle caramel and molasses notes before finishing crisp and clean. This popular German beverage is made to order in our Tasting Room all year round. Half lemonade and half beer of your choice, the S&O Radler is a refreshing alternative to a full strength beer. GREENHILL SEMI DRY – Mild sweetness with a tart, dry finish. Made in Vancouver with 100% West Coast BC apples supporting local farmers in the Fraser Valley. Naturally gluten free and vegan friendly. See below for current keg availability and pricing. To place a keg request submit style, size, and pickup date to cheers@steelandoak.ca. Please allow up to 72 hours for email response. We also rent pumps and buckets. Keep up to date on our latest beers and events. 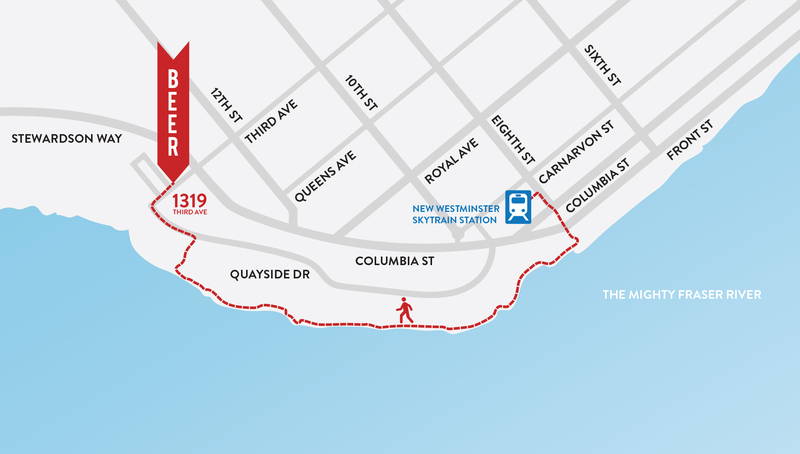 As the oldest city in Western Canada, New Westminster has a long and rich history. Selected by the Royal Engineers for its beauty and strategic location along the banks of the Fraser River, New Westminster was established as the first capital of the then colony of British Columbia. For over 150 years the Royal City has played an important role in the province and has been the site of many historical moments including; the completion of the Canadian Pacific Railway in 1885, the Great Fire of 1898, the creation of the Golden Mile in the late 40s and of course 143 years of brewing tradition along the mighty Fraser River. At once historic and modern, New West is now a city bursting with award-winning parks and restaurants, art studios, neighbourhoods with character, hipsters on bicycles and most of all an amazing sense of community – we couldn’t be more proud to call New Westminster our home. Yep! We even have lemonade on tap for them! Are dogs allowed in the Tasting Room? Currently dogs are not allowed in the Tasting Room. This is a Fraser Health regulation and although we love dogs (we have two of our own) they have to stay outside drinking some fresh puppy water we provide. Snackables like charcuterie share plates and beef jerky are always available and you are more than welcome to bring your own food in! Do you fill any growler from anywhere? You bet, as long as it’s 1L or 2L and holds beer, we’ll fill it. Do you sell kegs for private parties or weddings? We do! Check the “Private Keg Sales” section of our site for availability and how to order. Do you sell in bottles and cans or to liquor stores? Yes! We will most likely be at the liquor store nearest you. If you live in BC that is. It all depends on our production schedule. However you can inquire about group tours by emailing cheers@steelandoak.ca. Why do you run out of certain beers? Currently our beer is enjoyed faster than we can make it. So from time to time we will be out of a certain style of beer for a little while. Do you rent S&O out for special events? We do not. We are a full production brewery which is constantly a hub of activity so for that reason we cannot rent it out. Sorry, we do not take reservations. However, people always seem to find a place to sit.